These products are fully described in this datasheet. This product is described in the Sugar beet pulp, dehydrated datasheet. Sugarbeet pulp is the fibrous, energy rich by-product resulting from the water extraction of sugar contained in the root of the sugarbeet (Beta vulgaris L.). Sugarbeet pulp is relished by animals and much valued by farmers. It has an outstanding feeding value for all classes of livestock (ruminants, pigs and horses) but is particularly suited to dairy cattle as it has a galactogogue effect (Crawshaw, 2004; CNC, 2002). However, it should be noted that sugarbeet pulp results from various processes and may have variable quality. In the world, 86% of sugarbeet roots are processed into sugar and yield sugar beet pulp (FAO, 2017). It has been reported that 1 ton of sugarbeets yields approximately 150 kg of sugar and 500 kg of wet beet pulp (or 210 kg pressed beet pulp, or 50 kg dehydrated beet pulp) (Legrand, 2015). During sugar production, the beets are first cleaned and shredded into cossettes, from which the juice is extracted thanks to hot water (60-70°C). The juice is then processed like that of sugarcane, yielding sugar and beet molasses. After juice extraction the sugarbeet extracted fibrous material, that mostly consists of sugarbeet cell walls and about 2-4% sugar, can be used in many ways. This datasheet deals with the wet fibrous material i.e. wet beet pulp and pressed beet pulp. The latter product can be ensiled. The fibrous residue obtained after juice extraction, known as wet sugar beet pulp, contains 10-15% dry matter. Its high water content, regarding both transport and storage, limits its use to the vicinity of the sugar mill. Moreover, the high temperature of the water used for sugar extraction may favour bacterial development and compromise the preservation of wet beet pulp (CNC, 2002). The wet pulp can be pressed to remove the excess water, thereby raising the dry matter content to 20%. Pressed beet pulp is a white to grey product, the colour depending on the degree of oxidization and on the extraction adjuvants (see Potential constraints on the "Nutritional aspects" tab). At delivery, pressed beet pulp should be free of any mold and should have no acidic or acre odour, and it should not be sticky (Legrand, 2015; CNC, 2002). Pressed pulp, though easier to transport, has the same poor keeping qualities as fresh beet pulp. If pressed beet pulp is not adequately handled, it spoils quickly when it comes in contact with air, water, bacteria and fungi (Legrand, 2015; Crawshaw, 2004; CNC, 2002). Unpreserved pressed beet pulp should not be fed to livestock after 2-3 days of storage. A simple way to preserve beet pulp is to heap and cover it to remove the air, allowing it to be stored up to two weeks. A safer and better way to preserve sugarbeet pulp is to ensile it. 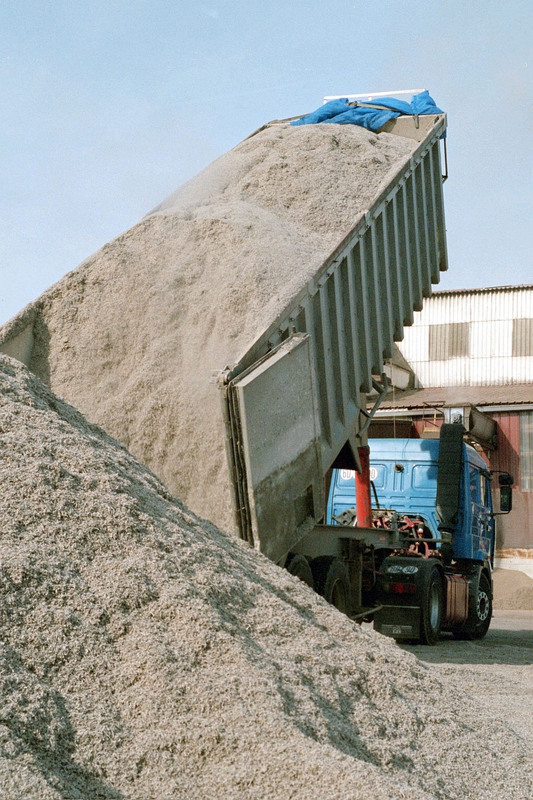 For longer storage, pressed beet pulp should be ensiled. Beet pulp readily ensiles if good ensiling practices are respected. It should be ensiled on a clean ground with clean machines, and correctly compacted to completely remove the air from the pulp. It should then be covered with a hermetic plastic sheet to prevent air introduction. In such conditions, lactic fermentation occurs readily and naturally. This process yields good quality silage within 30 days that is available for several months (Legrand, 2015; CNC, 2002). Sugarbeet ranks second behind sugarcane (269 million t vs. 1.88 billion t in 2013) for the provision of sugar. Assuming the fact that 1 ton of sugar beet root yields approximately 500 kg of pulp, wet beet pulp could virtually be about 117 million tons worldwide. However, all beet pulp is not used as wet or pressed beet pulp. Large amounts of these products are dried (see the sugar beet pulp, dehydrated datasheet). In France, in 2002-2003, wet beet pulp represented less than 2.5% of total beet pulp while pressed beet pulp accounted for about 23% and dehydrated beet for 74.5%. Wet and pressed beet pulp have to be used in the vicinity of sugar processing factories since they spoil quickly. In 2013, the main sugar producers produced 76% of worldwide beet sugar and hence the same percentage of beet pulp. They were Russia (35 million t), the USA (29), France (28), Germany (23), Turkey (16) and Poland (11) followed by Egypt (10), the UK (8), Ukraine (7) and China (6) (FAO, 2017). The five largest producing countries of dried sugarbeet pulp pellets are France, Germany, Russia, the USA and Egypt, together producing 66%, i.e. approximately 5 million t, of all global dried sugar beet pulp. However, the biggest producers of wet beet pulp were reported to be primarily the Netherlands, Belgium, Poland, Turkey, Russia, Ukraine and Iran (Beef and Feed, 2017). Sugarbeet pulp intended for silage should be delivered as soon as it has been produced at the sugar factory. Pressed beet pulp pH should be 4.5 and the pulp should be ensiled while it is still at 45-50°C. A careful scheduling of delivery from the factory to the farm should then be done. If the pulp temperature falls, the risk of butyric contamination increases. Once it reaches the ensiling area at the farm, the pressed beet pulp has to be ensiled and the silo must be finished within 24h. If the beet pulp is ensiled in silo, packing on a very clean place (concrete ground or plastic bale) with a clean tractor is necessary to remove the air from the mass. Packing should be done by layers, horizontal or diagonal. It is recommended to pack the silo with a double layer of plastic to keep the air out of the ensiled mass. Once fermentation has occurred, the temperature should decrease quickly. Good ventilation around the silo is thus preferable and the size of the silo should not be too large (not higher than 1.8-2 m and not wider than 8 m). If silage temperature remains too high after 3 weeks, the pulp becomes "fatty" and sticky, a condition resulting from a kind of pectin slow cooking that is deleterious to silage quality. After opening the silo, careful and regular removal of the ensiled beet pulp should be done (at least 1m/week during summer) in order to prevent neofermentation or mold development (Legrand, 2015; CNC, 2002). In the USA, it has been shown that pressed sugar beet pulp could be ensiled with other feedstuffs such as dry beet pulp or wheat middlings in order to improve preservation. 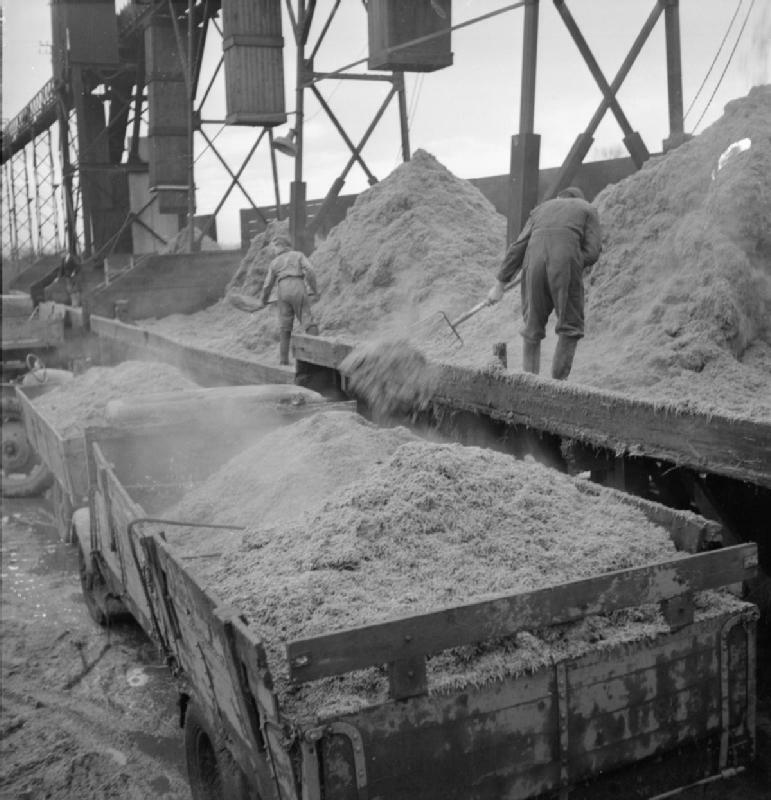 Adding sugar beet tailings, wheat middlings or maize improved the quality of the silage as it provided fermentable carbohydrates. Optimum moisture content for these silages was approximately 65% (Lardy, 2016). Butyric contamination should be avoided as it decreases milk products quality and has subsequent deleterious effects on cheese production (CNC, 2002). non sticky, fatty pulp (Legrand, 2015; CNC, 2002). The main form in which sugar beet pulp is traded and fed to livestock is the dehydrated form. However, drying sugar beet pulp requirements are equivalent to 33% of the energy consumption of the sugar factory (Mujumdar, 2014). The use of sugarbeet pulp in wet or pressed form thus saves a lot of energy. Since the beginning of sugarbeet processing, sugarbeet pulp has been traditionnally fed to livestock in order to reduce the disposal of these sugar by-products that would otherwise rise environmental concern. This use is economically and environmentally valuable (ADEME, 2016). In places where there are no farm animals, other ways of using sugarbeet pulp had to be found. These include the use of beet pulp in ethanol production, solid biofuel or as a raw material for paper (Brachi et al., 2017; Yi Zheng et al., 2012; Vaccari et al., 2005). Pressed sugarbeet pulp contains about 25% DM. The pulp contains about 7-12% DM of protein and moderate amounts of fibre: about 50% NDF, 24% ADF and less than 3% lignin. The sugar content is variable as it depends on the quality of the extraction and on the reintroduction of molasses. Other carbohydrates include pectins (15-18%) and other soluble and insoluble non-starch polysaccharides. Non-molassed beet pulp should contain less than 10% sugar. Because sugarbeet pulp is obtained from a root, it has a variable mineral content that may exceed 15%, for instance when the roots have been harvested in rainy conditions (which happens in temperate regions where harvest takes place in autumn) and not washed thoroughly. For that reason, the calcium content can be quite high. 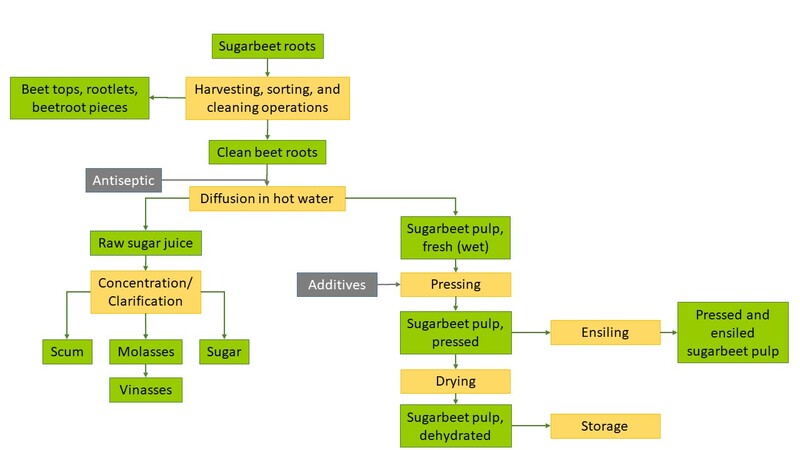 As wet beet pulp and pressed beet pulp result from processes depending on sugar factory management, they may have variable composition and quality. It is thus important for farmers to get as much information as possible from the sugar factory (see below information about pressing adjuvants) (Legrand, 2015; CNC, 2002). If pressed sugar beet pulp silage does not cool down quickly enough after the fermentation process, a part of the pectin can be cooked by high temperature and result in a pectin breakdown that makes sugar beet pulp yellow, fatty and sticky. This condition is detrimental to storage as the sticky pulp can undergo undesirable secondary fermentations and may raise problems of silo stability. In order to prevent pectin breakdown it is recommended to favour quick cooling. This can be achieved by using silage bags rather than trench silo, by storing pulp in underground silo or exposing the silo to the wind, using black plastic sheets, avoiding to put the beet pulp in a side by side silo or next to a heated building (Norell et al., 2007). If the cleaning of the beet roots is not well done, soil residues may bring butyric bacteria in the pulp and result in poor silage quality if the pulp has to be ensiled. In addition, soil residues subsequently reduce the organic matter of the beet pulp (CNC, 2002). If not properly preserved, pressed beet pulp silage is prone to molds and subsequent mycotoxins. In 2009 in France, a study assessing 40 samples of pressed beet pulp silage samples collected in 5 different regions reported that 34 samples contained molds, 27 samples were contaminated with yeasts and 8 samples were positive for mycotoxins (ochratoxin A, zearalenone, mycophenolic acid and roquefortine C). Two samples were found to contain zearalenone at levels exceeding the recommended level of 2000 µg/kg set by European regulations, and could have deleterious effects on reproductive performance (Boudra et al., 2015; European Commission, 2006). In Poland, the number of microorganisms found in pressed sugar beet pulp intended for direct feeding or silage in the majority of cases was reported to be within the range recommended by national regulation (Kowalska et al., 2013). during diffusion, it may be useful to add antiseptic solution in order to prevent further microorganism development. At high level, the antiseptic may hinder silage process. during pressing of the beet pulp, calcium sulfate or aluminium sulfate adjuvants are required to rigidify the beet pulp cell wall and increase pressing yield, but they can result in a S content too high for ruminants. S excess may have deleterious effects on animals. It results in loss of appetite, digestive troubles, reduced growth performance and it also causes secundary deficiencies in P, Zn, Cu, Se, and vitamin B1. In order to prevent sulfate toxicity, the inclusion of H2SO4 should be limited to 1300 g/t beet roots. When aluminium sulfate is used for beet pulp pressing, farmers should increase P supplementation in the diet. It is thus important for them to be properly informed by the sugar factory (Legrand, 2015; CNC, 2002). Pressed sugar beet pulp has a very good feeding value in ruminants. It is a bulky material that is highly digestible. Pressed beet pulp has a high energy value, higher than that of maize silage because of its highly digestible carbohydrates. Its mix of energy sources (pectin, cellulose and hemicellulose) provides a long-lasting energy release that is beneficial to ruminants' digestive system. Though the protein content is low in pressed sugar beet pulp, most of this protein is not degraded in the rumen and can be profitably supplemented with N soluble sources like urea or lush grass. Moreover, pressed beet pulp has a galactogogue effect in dairy cows that is valued by farmers (Nordic Sugar, 2017; Legrand, 2015; CNC, 2002; Leterme et al., 1992). Its poor protein content (< 10%) requires to supplement ruminants with a protein rich source or with non protein N sources such as urea when it is used to replace dietary roughage (Leterme et al., 1992). Its low fat content should be balanced if pressed sugar beet pulp is fed in large amounts (> 8 kg DM in the ration) (CNC, 2002). Its low lignin fibre (1.5-2.5%) may delay rumination and cause metabolic issues. It should be supplemented with fresh straw or hay that provide necessary long fibre (CNC, 2002). Though it has a high Ca content, pressed beet pulp is poor in P, Cu, Mn, Zn, in carotene and vitamin A. Mineral supplementation is thus necessary (CNC, 2002). Pressed sugar beet pulp should be progressively included in ruminant ration so that animals get used to it. Similarly, although it is considered to be at low risk of acidosis thanks to its high amount of pectins, pressed sugar beet pulp distribution should be fractionated if pulp makes a large percentage of the ration (CNC, 2002). Pressed beet pulp is highly palatable to steers. As high amounts of pressed sugar beet pulp could result in acidosis it is recommended to fractionate its distribution along the day. From a nutritional standpoint, there is no restriction to feed pressed sugar beet pulp at a high level. However, there is generally no more than 50% pressed sugar beet pulp in practical rations (DM basis) because it reduces DM intake and increases moisture content and bulkiness of the diet (Lardy, 2016). It was possible to feed fattening steers on pressed sugar beet pulp enriched with urea-molasses and to obtain a high average daily gain of 1.51 kg. This ADG could be increased to 1.74 kg when animals were also offered rolled barley of bran as supplementary energy (Istasse et al., 1990). It is generally considered that pressed sugar beet pulp can be fed up to 40% of the diet in growing cattle. However, it has been shown that over 20% inclusion, intakes of growing and fattening animals were reduced. It has thus been recommended that pressed sugar beet pulp be included at 5 to 15% of the diet when intended as a roughage replacer (Lardy, 2016). In a recent study, the addition of pressed beet pulp (from 8% to 25% of the diet, as a replacement of maize) to the diet linearly decreased (P=0.001) DM intake and ADG of growing steers (282 kg BW) (Bauer et al., 2007). Similar results for ADG were reported when pressed sugar beet pulp (up to 20% of the diet, DM basis) was offered to fattening steers (456 kg BW) in order to replace high-moisture maize. Overall DM intake tended to be reduced when pressed sugar beet pulp was used (Bauer et al., 2007). In finishing cattle it has been reported that the energy value of pressed sugar beet pulp was greater than that of maize silage. In fattening bulls fed ad libitum on pressed sugar beet pulp silage, an ADG of 1.15 kg was obtained, being 12.5% higher than bulls feed on maize silage. Bulls fed on pressed sugar beet pulp silage had higher abdominal fat content, and dressing percentage was slightly improved. Meat characteristics were also slightly modified with higher DM, crude protein and fat content. The use of pressed beet pulp silage reduced concentrates by 40%, and resulted in lower feed cost (Bendikas et al., 2003). In high-yielding dairy cows (43 kg milk/day), pressed beet pulp could be included during 118 days, in a total mix ration at 20% (DM basis) of the diet in order to replace maize silage. It significantly reduced DM intake but had no effect on milk yield, milk fat or milk protein content, which suggested that pressed sugar beet pulp improved diet digestibility (Boguhn et al., 2010). These results were in accordance with earlier observations on early lactation dairy cows receiving either dehydrated beet pulp, either pressed beet pulp or maize silage at low or high level. Pressed beet pulp also resulted in higher peak production but did not change long-term milk production (Visser et al., 1990). Similar observations were made on mid-late lactation dairy cows: mean daily DM intake was significantly lower for the animals receiving the wet beet pulp ration (20.79 vs. 24.11 kg) and milk yield and composition were not significantly different (Argyle et al., 1992). In France and Belgium, several trials showed that pressed sugar beet pulp increased milk yield by 1-3 kg/day/cow. When included at high level (6 kg DM/day/cow), sugar beet pulp decreased milk fat content and increased milk protein content (Legrand, 2015; CNC, 2002; Morel d'Arleux et al., 1995). When pressed sugar beet pulp silage (at 33% of the diet) was compared to wheat grain as a supplement to maize silage, it was reported to result in slightly higher milk yield but lower milk protein content. The milk fat remained unchanged in both diets and cows gained 250 g daily (Hoden et al., 1990). Regarding milk quality and particularly CLA content, it was shown that sugar beet pulp yielded significantly higher levels of the desirable isomers t11c13, t9t11 and t7t9 in comparison to a cereal mix (Renna et al., 2010). In late gestation cows (3-4 weeks before calving), it was recommended to limit pressed beet pulp as the Ca content in sugar beet pulp may result in milk fever. Pressed sugar beet pulp is not recommended in calves as important amounts would expand in the rumen and hamper normal digestion (CNC, 2002). In pig farming, pressed beet pulp is suited to growing and fattening pigs, and also to sows provided its inclusion remains below 4 kg/day/animal (1 kg DM/day/animal). Pressed beet pulp silage reached 50% DM intake in growing and heavy pigs (34-144 kg LW) without problems and resulted in lower gastric lesions (Scipioni et al., 2001). Included at 15% in pig diets during 182 days, pressed beet pulp silage increased average daily gain of growing pigs and had no effect on feed conversion ratio. The high energy supply of beet pulp could reduce feed cost (Martelli et al., 1999). At 17% dietary inclusion in heavy pig diets, pressed beet pulp silage did not alter growing performance or slaughtering performance in comparison to pigs fed on cereal and soybean meal based diets (Scipioni et al., 2001). At the same inclusion level, it had been previously shown that growing pigs could gain 566 g/day, and feed conversion was slightly improved in comparison to the concentrate diet (Parisini et al., 1991). Weight of the digestive tract was significantly greater in pigs receiving pressed beet pulp silage (Parisini et al., 1991). Pressed beet pulp did not affect carcass parameters such as backfat thickness or slaughter yield, and meat quality was not significantly affected (Parisini et al., 1991). In the production of Parma ham, pressed beet pulp did not hinder meat characteristics like weight losses of hams or fatty acid composition of hams over the seasoning period (Scipioni et al., 2001). Similar conclusions for meat were reported when pressed sugar beet pulp silage was used to replace barley (150 g/kg DM) and average daily gains were increased (Scipioni et al., 2001). In a further experiment, pressed beet pulp silage replaced 10 or 20% barley in barrow and gilt diets based on sweet whey during 133 days. Pigs, either male or female, had no differences in growth performance but percentage of lean cut were significantly higher while percentage of fat cut were lower. Meat curing characteristics were slightly degraded: weight losses were higher for pigs fed on pressed beet pulp silage and meat colour was affected by pressed beet pulp silage (Martelli et al., 2002). The addition of molasses or vinasse to pressed beet pulp has been assessed in growing pigs. It was shown that the inclusion of pressed sugar beet pulp silage alone (without molasses or vinasse) was more effective in increasing animal performance (Scipioni et al., 2001; Martelli et al., 2000). Moreover the addition of vinasse resulted in lower feed intake when the mixture of pressed beet pulp silage and vinasse was included at 20% of the diet (Martelli et al., 2000). Including pressed beet pulp at 15-30% of the diet (DM basis) significantly reduced faeces and ammoniacal excretion (Legrand, 2015). It had been reported that every 5% increase of sugar beet pulp silage inclusion in barrow diets decreased the manure pH by 0.4 to 0.5 and subsequently reduced NH3 emissions by 15% (Canh et al., 1998). Increasing levels up to 24% DM pressed beet pulp silage resulted in a significant reduction in nitrogen excretion in the urine (Martelli et al., 2000). Pressed beet pulp silage is palatable to sows. It could replace 33% concentrate in sow diets and reduced water intake and urine excretion by almost 50%. It also significantly reduced P excretion in faeces and urine (Haaksma, 1992). Feeding sugar beet pulp to sows improved their behaviour: as they have slower digestion, they are more placid, and piglet trampling is less frequent. Piglets also tended to be heavier (Haaksma, 1992). The use of pressed sugar beet pulp silage ad libitum was assessed for geese feeding. It was shown to reduce final BW (at 14 weeks) and ADG while it had no effect on meat pH or colour. Pressed sugar beet pulp decreased lipid oxidation in muscles 3 days after slaughter. Fat composition was characterized by a significantly higher content of myristic and linoleic acid, and a lower content of oleic acid, which are suitable for the consumer health (Karwowska et al., 2017). Literature on the use of wet sugar beet pulp is very scarce. However, pressed sugar beet pulp was used during the last century in Germany in some traditional rabbit feeds, but at a relatively low level, 5% of the complete diet (Scheelje et al., 1967). Beet pulp ensiled without any additive is palatable to rabbits as to goats, sheep and dairy cattle (Sutoh et al., 1964). But if the silage quality is improved by addition of a liquid mixture of molasses and urea during preparation, the result is a product with pH 4.5, with 1.89% lactic acid and no butyric acid, the palatability of which is largely improved for all tested animals, including rabbits (Sutoh et al., 1964). 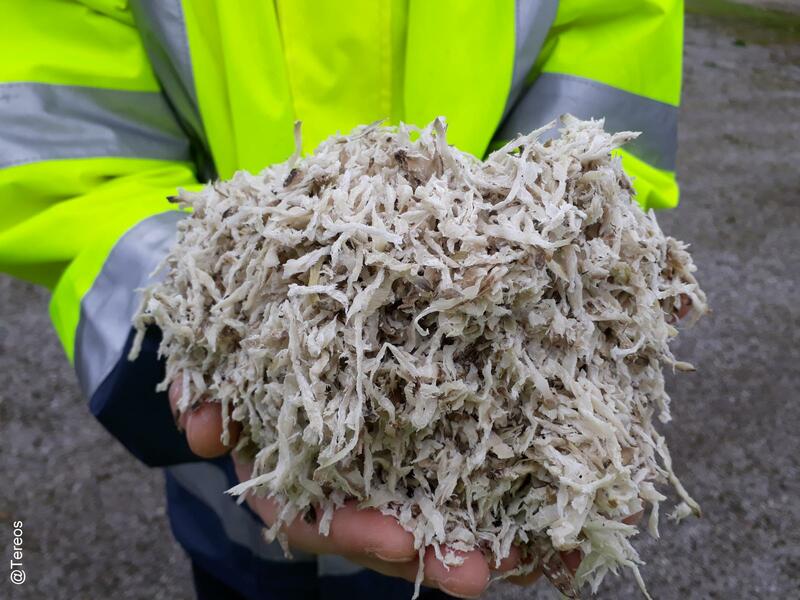 If sugar beet pulp silage should be used in rabbit feeding, it should be considered mainly as a source of digestible energy, rich in digestible fibre, but with a very low level of true protein. Effectively it is highly likely that the quality of protein is seriously worsted during the fermentation of the silage, as it was observed in the case of ensiled alfalfa (Perez et al., 1990). Beef and Feed, 2017. Sugar Beet Pulp Pellets (SBPP). Beet & Feed Ingredients A.S.
Draycott, A. P., 2006. Sugar beet. Blackwell Publishing, 514 p.
Harland, J. I. ; Jones, C. K. ; Hufford, C., 2006. Co-products. In: Draycott, A. P. , 2006. Sugar beet. Blackwell Publishing, 514 p.